Nikki Rowe's Jackelyn Alanis, Player of the Year at McAllen Memorial on Monday Dec.11,2017, in McAllen. Warriors junior Jackelyn Alanis is The Monitor’s All-Area Volleyball Player of the Year. McALLEN — When Jackelyn Alanis’ phone rang on Dec. 9, she was initially unsure why McAllen Rowe coach Magda Canales was calling. Then, Canales gave her the news: Alanis had won The Monitor’s All-Area Player of the Year award. Alanis spent her freshman year at PSJA High before transferring to Rowe in 2016. After leading the Warriors in kills (478) and aces (39) as a sophomore, Alanis blew those marks out of the water during her junior year. 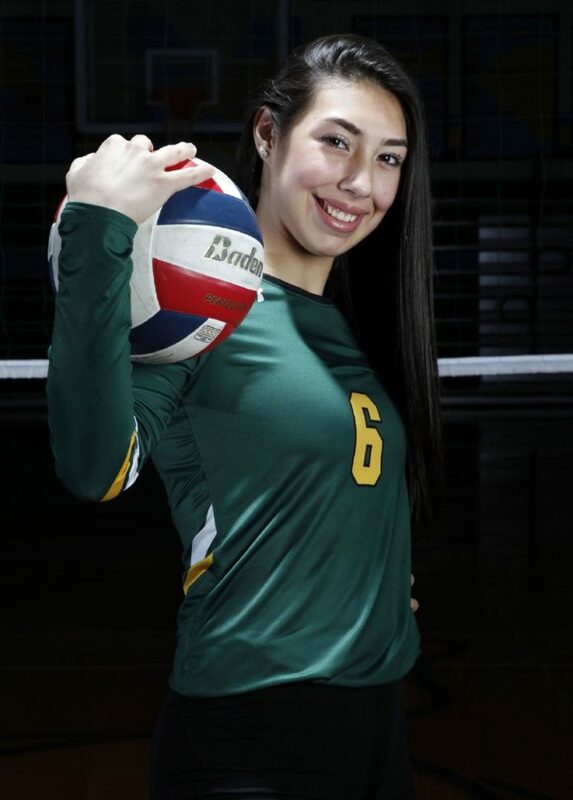 Her 811 kills and 60 aces were big reasons why Rowe captured a district championship and a Sweet 16 appearance in the UIL Class 6A state playoffs. “My mentality was to be focused, take the game point-by-point and stay calm,” Alanis said. “If we got a kill, I’d go, ‘OK,’ and move on. It’s in the past. Keep going. As one of four underclassmen on the Warriors’ roster, Alanis made a plea to the team’s seven seniors before the year began. The intense workload and expectations placed squarely on Alanis’ shoulders weren’t always easy to bear. With Alanis’ help, Canales coached the Warriors (35-8) through two preseason tournament championships and put together a 4-1 record against sister schools McAllen Memorial and McAllen High. In a season during which the Warriors competed in the Regional Semifinal round of the UIL Class 6A playoffs last month on Rowe’s home floor, Alanis’ most memorable moment occurred shortly before the postseason began.